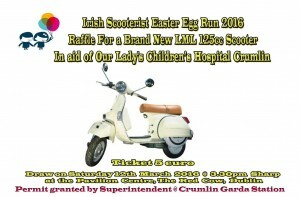 A great day out is in store for the Irish Scooterist Easter Egg Run 2016 which takes place on Saturday 12th March 2016. Assembling at the Bandstand on Bray Seafront from 11:30am, the rideout will depart at 12:30 sharp for the Pavilion Centre, Red Cow Hotel, Naas Road, Dublin where a fun day out awaits participants and spectators alike including a custom bike show and the opportunity to win a brand new LML125 scooter in the raffle. Tickets now on sale, contact organisers for details! 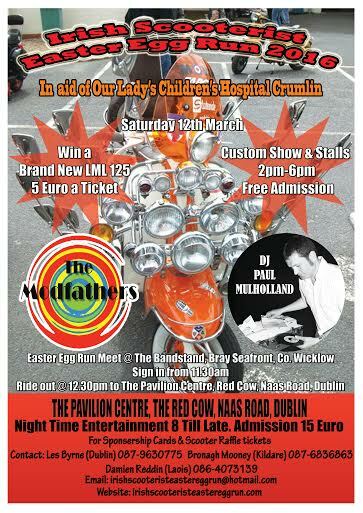 Evening entertainment kicks off at 8pm in the Pavilion Centre with the Modfathers followed by DJ Paul Mulholland till late. Admission is just €15 and a great night out is guaranteed! All proceeds in aid of Our Lady’s Children’s Hospital, Crumlin.